Sometimes, all you need is Jimmy Page and his guitar. The two of them have made stellar, unforgettable music decade after decade. 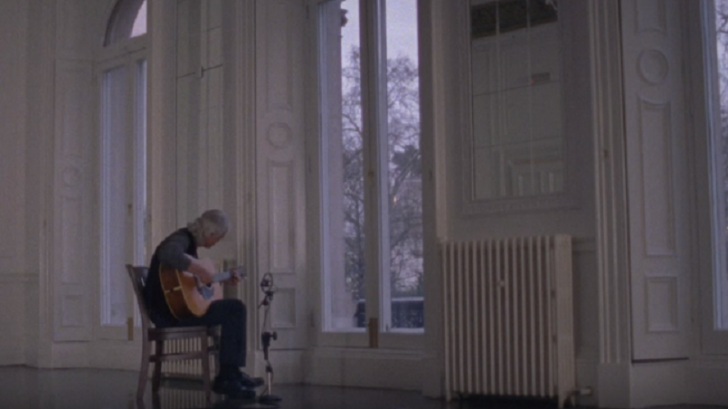 An outtake from the 2008 documentary “It Might Get Loud” shows the Led Zeppelin guitarist sitting in a large room and playing an instrumental. It doesn’t sound like much when you just read about it but knowing Jimmy Page, he never settles for anything less. And perhaps one thing we like about this is how raw and pure the whole jamming session sounds. No theatrics, guitar showmanship or any other tricks – just a man playing his guitar and chilling. He is considered as one of the greatest guitarists of all time for a reason. He doesn’t play to JUST PLAY. His fingers make the guitar sing. From the feel to the groove, there’s nothing quite like listening to him do his thing. We’ve seen him go wild on stage and melt our faces off so it’s absolutely refreshing to see him sit down and go mellow. It’s perfectly imperfect. Even at his age today, he can still outshine every other young professional guitar player. That’s seriously something especially considering he is no longer at his prime. Because at the peak of his career, Jimmy Page was truly unstoppable. Well, he still actually is.